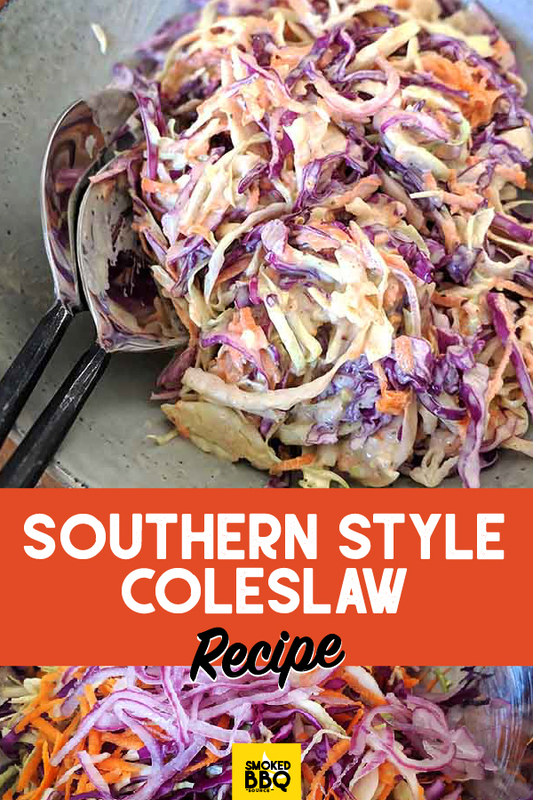 This southern style coleslaw is a creamy, sweet and tangy addition to any meal. 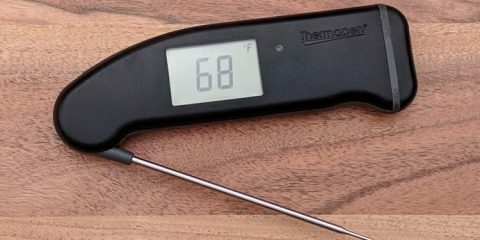 It’s perfect to serve alongside delicious smokey barbeuce you’ve labored over all day. One of the best things about this recipe is that the dressing is really easy and quick to make! And you probably already have most of the dressing ingredients on hand. 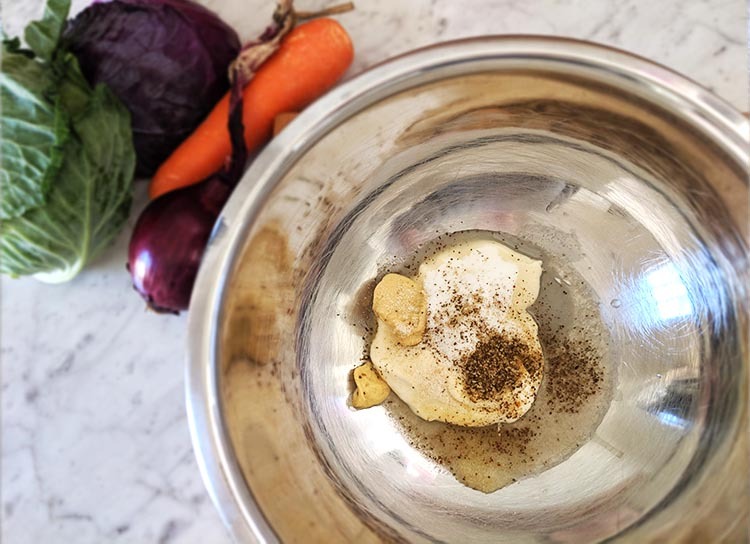 We initially found a similar recipe on Barefeet in the Kitchen, but had to make a few adjustments to suit our pantry (eg we couldn’t find celery seeds at our local supermarket so we have substituted for celery salt). 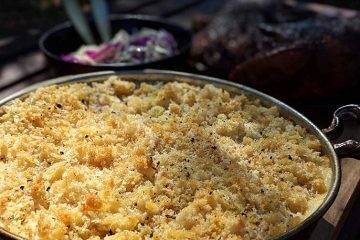 We were super happy with end result and now use this new version every time we crave a slaw with that creamy zing to cut through fatty pulled pork or barbecue ribs. 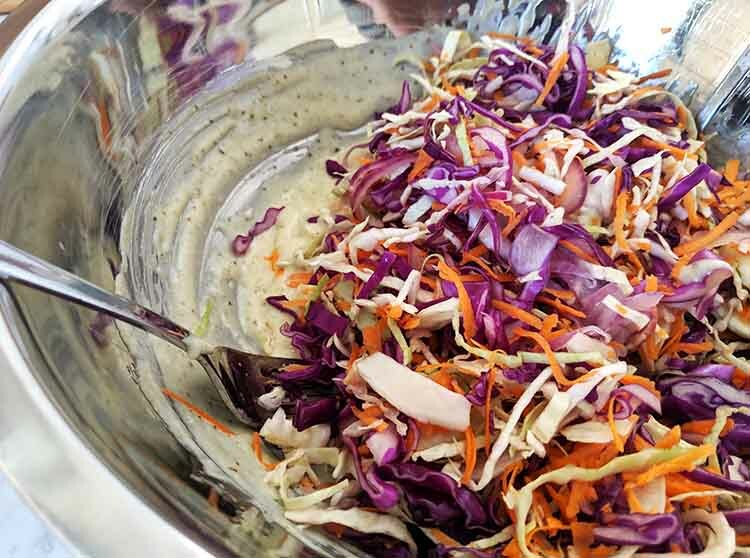 To make the dressing, add the mayo, dijon mustard, apple cider vinegar, onion powder, and celery salt into a large bowl. and voila! Your dressing is done. Told you it was nice and easy didn’t I? 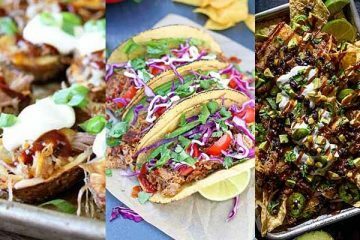 You can also really easily double, triple or multiply this recipe to your hearts content, I personally find that these measurements suit four people really well. Sometimes I find that the pre-prepared slaw mixes don’t have the best taste, or rather they all seem to have ‘that taste’, which we don’t love. Most of the time we make the effort to prepare our own. 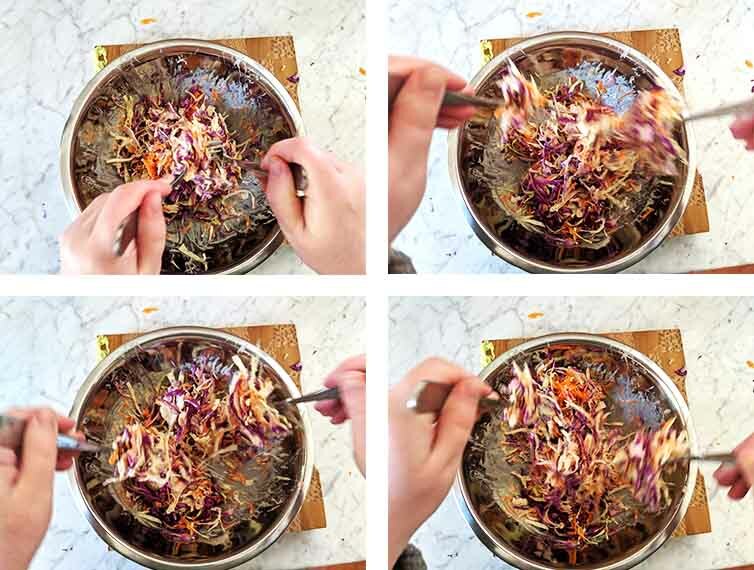 However you’re more than welcome to use the bagged slaw mix, it can make things so much simpler. Especially if you’re short on time or cooking for a big crowd! 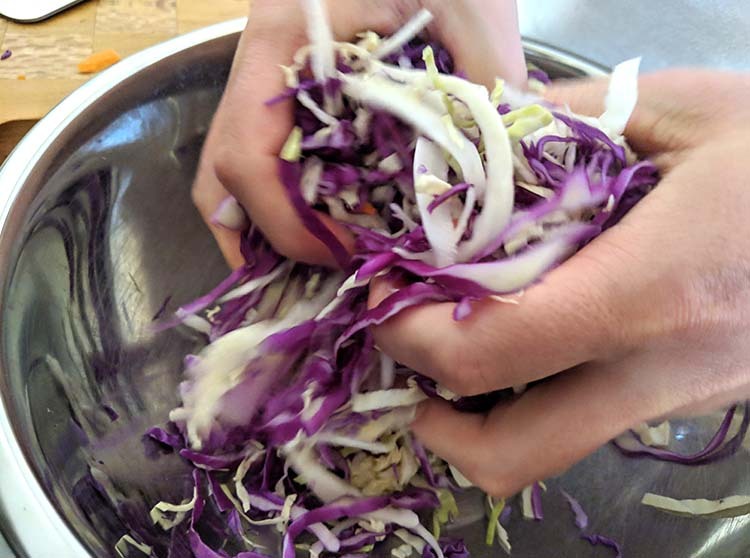 For the slaw mix, just finely slice about a quarter of each red and green cabbage, grate a small carrot and finely slice a quarter to a half of a medium red onion. 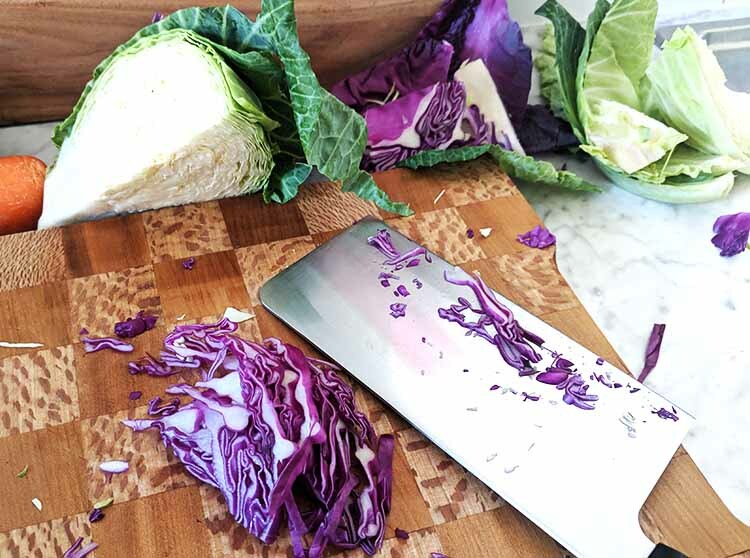 After I have sliced the cabbage I like to give it a little massage when I add it to the bowl. This just helps to soften and tone down any bitterness (especially with the red cabbage) making much more pleasant to eat. 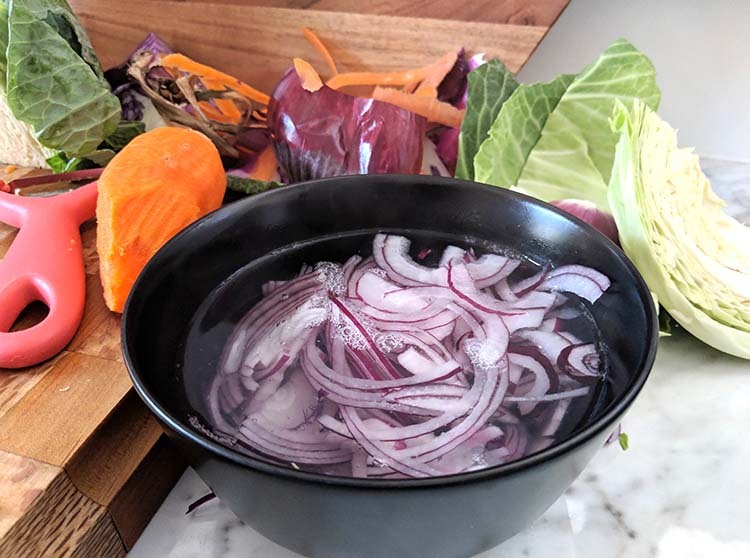 Before adding the red onion in with the cabbage and carrot, place it in a small bowl and pour boiling water over it. Leave it to soak for a few minutes, essentially par cooking it. This helps get rid of the strong raw taste you get with onion and that can sometimes be unpleasant. So instead of leaving you with bad breath it will leave you coming back for more. After leaving the onions to soak for a few minutes drain, rinse with cold water and then lay out on paper towels to pat dry. 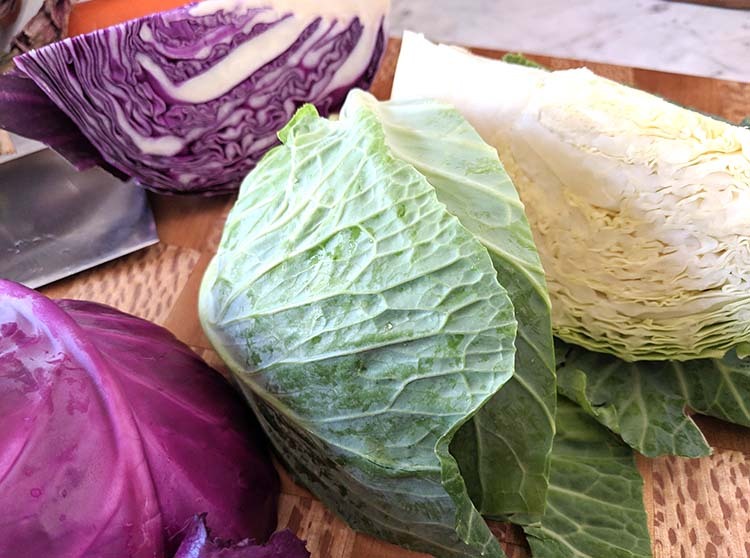 Once the excess moisture has been removed, add the onions in with the cabbage and carrot before giving it all a mix through. 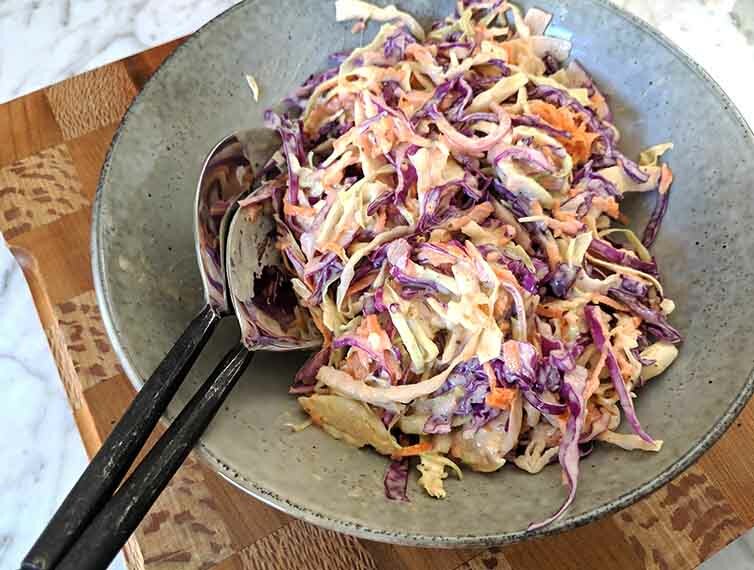 This is a really moist and creamy slaw, so just before I’m ready to serve or use the dish I’ll add the veggies to the dressing. And then give it nice big toss, making sure all those little rainbow strands are covered in the delicious sauce. Now you can leave it the bowl you mixed it to serve or use in another recipe, or transfer to a nice serving bowl and really impress your guests. Like most slaws this one is best eaten within a few hours of being made, but will keep in the fridge for up to two days. Just drain any excess before serving. Here you have it! 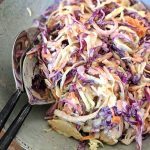 A delicious recipe for a southern style coleslaw perfect to go with any barbecue you’ll be cookin’ up this weekend. 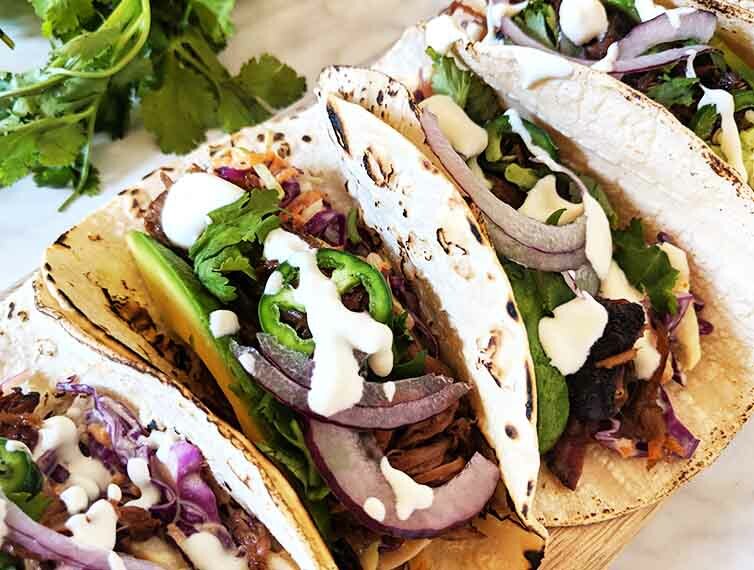 Or use it as a base on these pulled pork tacos. 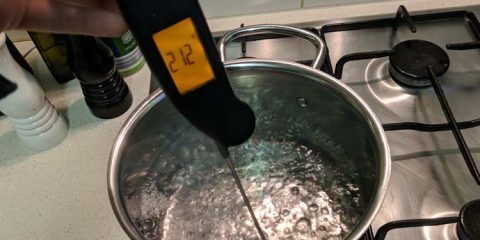 Placed the sliced onion in a small bowl and cover with boiling water. Leave this to sit for a few minutes. Drain and rinse under cold water before patting dry with paper towels. In a large bowl add the mayonnaise, dijon mustard, apple cider vinegar, onion powder and celery salt, giving it a good mix until the ingredients are all incorporated. 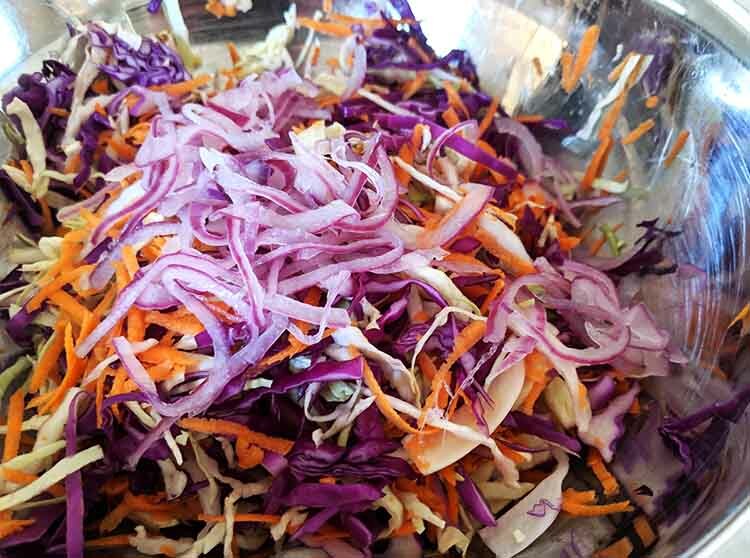 Mix the onion in a bowl with the cabbage and carrot, then set aside. Just before serving add the cabbage mixture to the dressing and toss to combine. 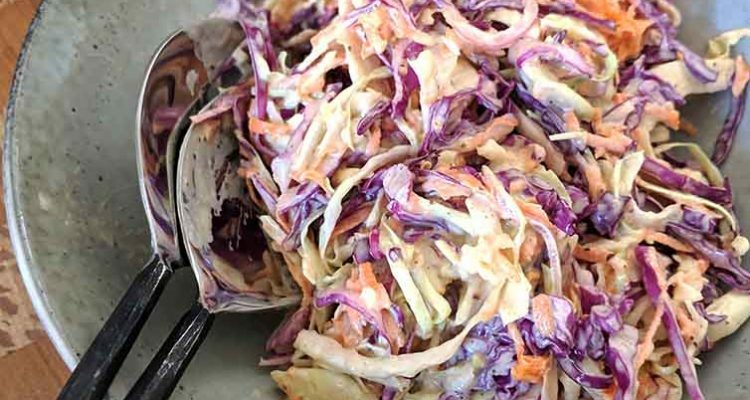 To cut down time even further use a bag of coleslaw mix that weighs around 8 ounces.